Jeff Bezos and Amazon already oversee dominant or emerging powerhouse businesses in cloud computing and storage, e-commerce, rockets, ebooks, smart speakers, and original programming (check out the $250 million they recently paid for just the RIGHTS to make two Lord of the Rings TV shows). Now, they’re making a new move into influencer marketing. There’s a new wrinkle in the long-running Amazon Associates affiliate program: The company is now offering Youtube, Twitter, and Instagram influencers the option to set-up a simple storefront on Amazon.com. Social media stars can send their audience to these storefronts to buy recommended products. The store comes with an easy-to-remember vanity URL—especially useful for YouTubers who often promote URLs with audio only. Commissions average about eight percent of referred sales—perhaps not a windfall, but potentially quite attractive for influencers able to move real merchandise. Take, for example, YouTube star Dan Markham. While on a panel at Web Summit (where Amazon announced that Twitter and Instagram influencers would now be eligible), Markham revealed he sold $161,000 worth of fidget cubes through his Amazon store, netting more than $12,000, according to coverage in TechCrunch. That is a LOT of fidget cubes. First, from Amazon’s perspective, it’s low-hanging fruit. 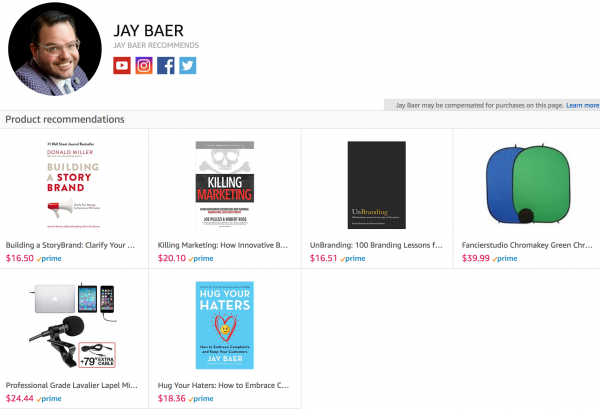 Why NOT run these referred sales through your massive e-commerce empire? Somebody has to sell fidget cubes and whatever else consumer product influencers are pitching. And I’m sure that in many cases, those sales were already coming through Amazon, but in a haphazard fashion. Second, from the influencer’s perspective, it’s a no-brainer. A storefront that requires essentially no work and no fees? Custom URL? Eight percent commission? Yes, please. This is the same reason Amazon has been such a huge player in affiliate marketing for nearly 20 years—they make it easy to make money together. They are like the Jerry Maguire of e-commerce. Third, from a brand perspective, this is terrific if you’re using influencers to drive consumer product sales. Now, you have definitive tracking of units sold, and thus evidence of why, whether, when, and how much influencer marketing is working. No more guessing games. And after all, isn’t influence about driving action, not just awareness? This helps connect those dots. And it IS so simple. I was accepted into the program based on my Twitter following. I built a storefront in five minutes and included some favorite recent books, a microphone I like, and a green screen I bought recently for video work. Presto! Now, I just need to sell $161,000 worth of green screens! But upon further reflection, this move troubles me. Amazon’s market penetration gives them the ability to dominate influencer marketing in short order. What’s to stop them from going one more step and creating their own database of influencers? Why wouldn’t they add a services layer to help brands find and select influencers too (the same way they’ve organized affiliate portals in the past)? And then, why couldn’t they ask influencers to create content on the Amazon video network, rather than YouTube or another platform? Or audio versions for Alexa? If you’re making $12,000 hawking fidget cubes, and the guy writing the checks says you need to put all your content on Amazon now to keep getting paid, you’re going to give that request serious consideration, I’d wager. The one historical truism of digital marketing through the years is that whoever controls the metrics controls the budget. 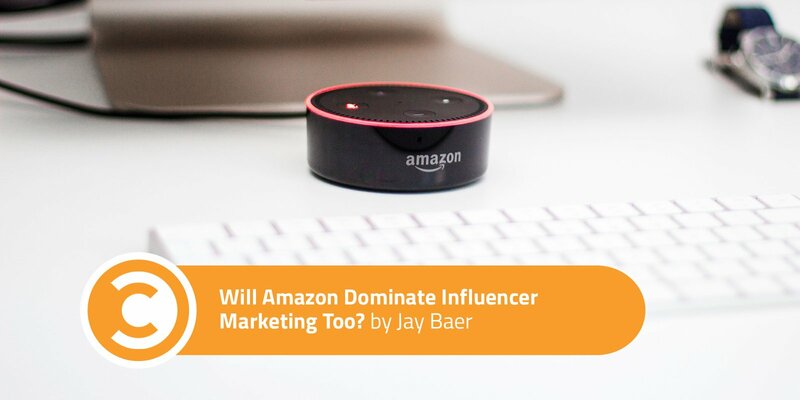 And if Amazon becomes the de facto scorekeeper for influencers via their storefront program, it’s not at all a stretch to imagine the entire influencer marketing ecosystem disrupted and subsumed by Amazon. There are plenty of marketers who would welcome that kind of disintermediation. Lots of folks would prefer the turbid bouillabaisse of influencer marketing agencies, software, and measurement to just disappear. It’s too confusing and uncertain, they say. But an Amazon-dominated influencer marketing landscape is the precise opposite: It’ll be crystal clear who’s in charge and how it all works, but as always, Mr. Bezos and his associates will extract their pound of flesh. Do you want to hand them a knife?